Buying a car or motorcycle will no more make a dent in your pocket. 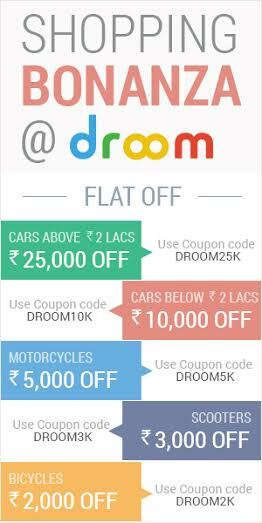 Droom.in is presenting fantabulous deals on automobiles. Droom has just launched its new campaign droom Comes True, providing flattering discounts on cars, motorcycles, scooters, and bicycles. Apply respective droom offer code at time of order to add these savings in your basket. Known for offering easy and trusted platform, Droom is India’s first marketplace for buying and selling new or used automobiles. From luxury car to fascinating motorbike to stylish cycle, shop any vehicle with huge savings. So, just get set and shop. Don’t forget to download droom app to get these hot coupons. Droom Launching Fully Functional Website to Buy and Sell Automobiles! I do believe everyone could learn a bit from your experience.